Visual Basic | Creating properties exercise | Snog, Marry or Avoid - in VB.NET! Snog, Marry or Avoid - in VB.NET! Press CTRL + D to add the file called frmSmaGetNames.vb from the above folder into your project (or right click on the project and choose to add it as an existing item). Do the same thing to add the form called frmSnogMarryAvoid.vb into your project from the same folder. 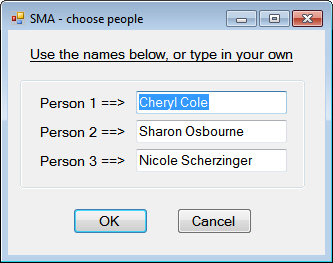 The form loads with default people, but you can change these to suit your tastes. Before continuing, have a look at the existing code to see what it does. You should see that this creates a public variable called Persons, whose private equivalent is called pPersons. This is a commonly used technique in Visual Basic - you should start to get used to it! create a list of choices (snog, marry and avoid, basically), and set this list to be the data source of the second list box. The model answer contains 2 properties, 2 event-handler routines and 3 other procedures, for comparison.